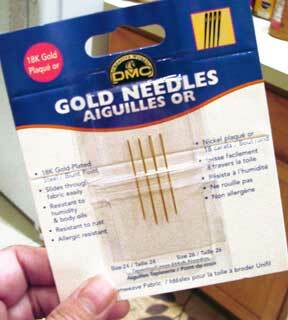 Bought myself a teensy present at the crafts store this weekend: four gold-plated DMC embroidery needles. I’ve always wanted to try this kind of needle and since they were on sale for $1.99 it seemed a cheap treat. 🙂 They are supposed to “slide easily through fabric and be more resistant to rust”, so I shall see if this is true. I've got some of those needles. and i love them. they slide through your fabric like a hot knife through melted butter. It's a good thing.